Madison Fire Chief Shawn Howard has taken on added duties as chief in Skowhegan replacing Richard Fowler, who was fired last month. SKOWHEGAN — Longtime Skowhegan firefighter and department captain Shawn Howard took over Monday as the town’s new fire chief. The position is now shared with Madison, where Howard also is fire chief. Howard, 36, was appointed Friday by Town Manager Christine Almand. He succeeds former Fire Chief Richard E. Fowler Jr., who was fired by Almand in August after just three months on the job amid a criminal investigation involving the fire department in Farmington, N.H., where Fowler was chief during the period covered in the investigation. Howard grew up in Madison and graduated from high school in Skowhegan in 1996. He said he did not apply for the Skowhegan job earlier this year when the position became vacant because it would have conflicted with his personal life. He lives in Cornville with his wife, Theresa, a registered nurse, and their two boys, 7 and 8. Howard said the Madison and Skowhegan departments have always worked together, even sharing 10 firefighters. As fire chief, Howard will work three 12-hour shifts in Skowhegan, to be followed by a 10-12-hour shift as chief in Madison. His starting salary in Skowhegan is $63,500 and he receives a monthly stipend of $750 from Madison. He said the shared position will work well, as both departments work closely together and with neighboring towns for call response and mutual aid. Fowler, 47, came to Skowhegan in May from Farmington, N.H., where he had been the fire chief. He took over for longtime firefighter and fire chief Tom Keene, who was terminated Dec. 30 by then-Town Manager John Doucette Jr.
Keene, 58, had been a firefighter for more than 40 years and chief for 21 years. In the last two years, both his legs were amputated because of complications from diabetes. Strafford County (N.H.) Attorney Thomas Velardi on Aug. 11 announced the investigation into the possible theft of revenue from Farmington, focusing on the town’s Fire Department, where Fowler had been chief. Velardi would not say how much money was missing and did not name Fowler as a suspect. Velardi said the investigation meets the New Hampshire “felony threshold” involving more than $1,500 and stretches back several years. The criminal investigation into the department formerly headed by Fowler could stretch into October, Velardi said in August. He was out of his office Thursday and unavailable for further comment. In her Aug. 8 letter to Fowler notifying him of his dismissal, obtained by the Morning Sentinel under a Freedom of Access Act request, Almand wrote that since Fowler had not completed a six-month probationary period, the town could terminate his employment without notice. The town had the right to terminate employment at any time without cause and without requirement of a hearing, she wrote. Almand said she met in executive session with the Skowhegan Board of Selectmen last week and was given permission to hire a new fire chief from within the department’s ranks. She met with Howard on Thursday and he was hired Friday. Howard, who also is a registered Maine guide, a firearms dealer and a gunsmith, started as a Skowhegan call firefighter right out of high school in 1996. He was hired full time in January 1998 and enrolled at the state fire academy later that year. He was promoted to the rank of captain in 2008. 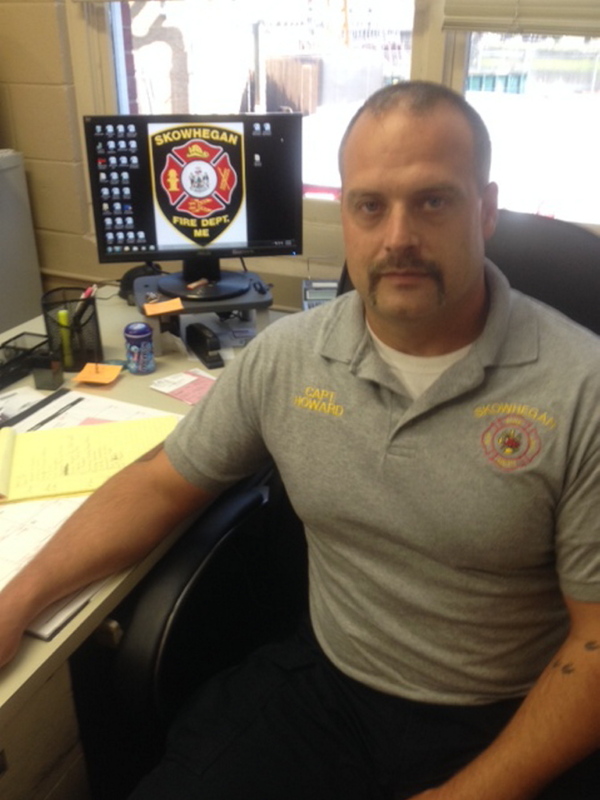 Howard now runs the Skowhegan department with eight full-time firefighters, including two captains, 23 call firefighters, three fire engines, a ladder truck and a utility truck on an annual operating budget of $803,000, with a $170,000 capital reserve account. The Madison department has about 24 call firefighters with an annual budget of $110,100.